Back in December, Search Engine Land ran an article called What You Learn From Talking With Google’s Largest Advertisers All Day, Every Day. Written by Matt Lawson, it’s an interview Lawson did with Google’s chief search evangelist, Nick Darveau-Garneau. Nick answers questions about trends, automated features such as smart bidding and dynamic ads, and the lifetime value of a customer. 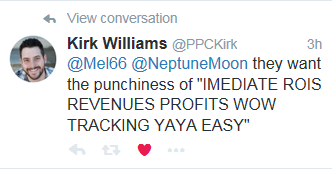 He gets into profitability, saying that rather than obsessing over CPA or ROAS, advertisers should look at their profit. I agree with that advice. That got my attention. And I totally disagree with him. Oh, and don’t forget to bid on all the keywords. Do you notice a pattern here? 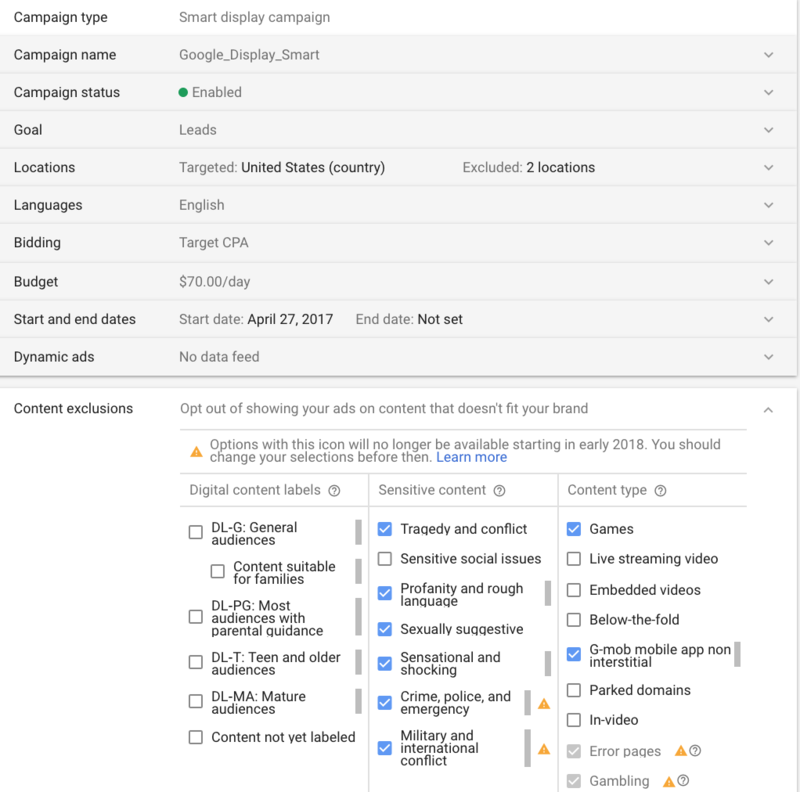 Every single recommendation in the article is to just use all of Google’s tools to optimize your campaigns. I’m not saying that no one should use any of the tools Nick mentioned. In the right circumstances, each of these options makes sense. But I would not use all of them, all the time. I never use optimized ad rotation. I prefer to use third party bid automation tools rather than Google’s bid rules. And dynamic ads and campaigns are a nightmare for B2B advertisers. I’ve never been a fan of handing Google the keys to your marketing campaign success. I’ve seen time and again where using Target CPA bidding can throttle the volume of your campaign, killing revenue and profit. I would never simply bid on every keyword possible. That is a worst practice, bordering on irresponsible in my opinion. But hey, trust us. We’re Google. Nowhere is Google’s arrogance more apparent than with the new Adwords UI. 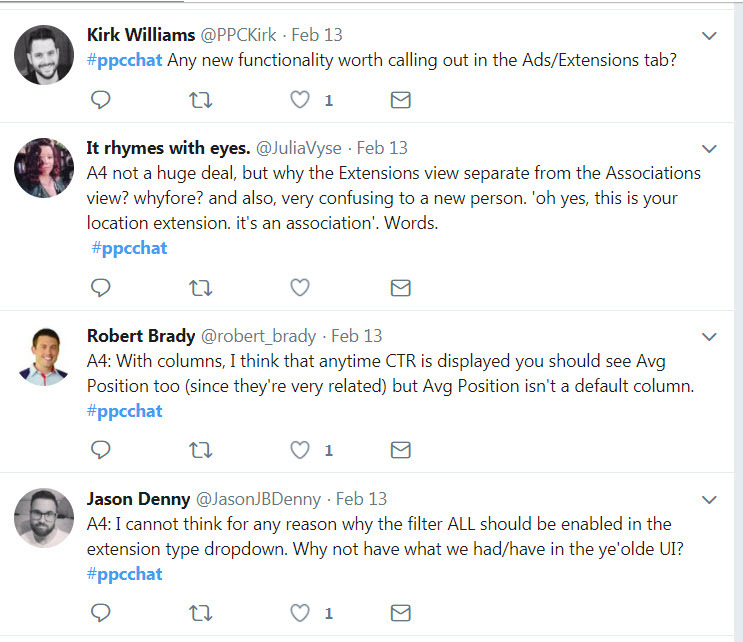 This week’s PPC Chat on Twitter was all about digging in to the new UI. 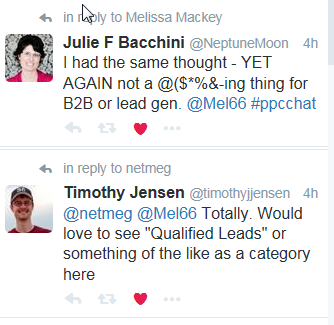 I had a client meeting and had to miss most of the chat, but you can find it on the #ppcchat hashtag. While participants praised a few elements in the new UI, the overwhelming sentiment was that it’s much harder to use, missing key features, and slows down workflows. Take the Extensions section, for example. Users find the labels confusing and meaningless. Exactly. GA has moved things around in the past. When the most recent version rolled out, the transition was seamless. It was easy to find what you were looking for. 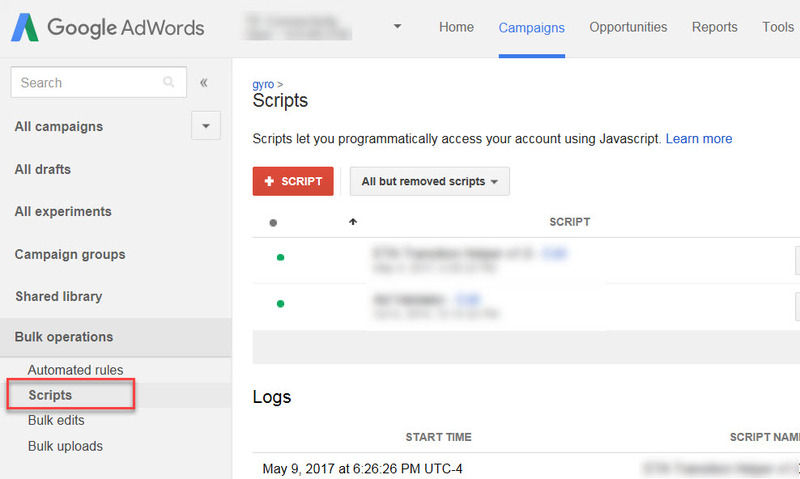 Adwords supposedly crafted the new Adwords UI to act more like GA – but it misses the mark. Nothing is where you expect it to be. Key features are missing or hidden. Custom columns are gone. And there’s horizontal scrolling. It does not appear that Adwords designed the new UI with input from actual users. But why would they? They think it’s better, so it must be. Trust us, we’re Google. Do you agree? Or should I put away my cane and stop telling people to get off my lawn? Share in the comments! I’ve written before about expanding your Adwords account with ad extensions. Using remarketing and RLSA is another effective way to market to people who’ve already visited your website. 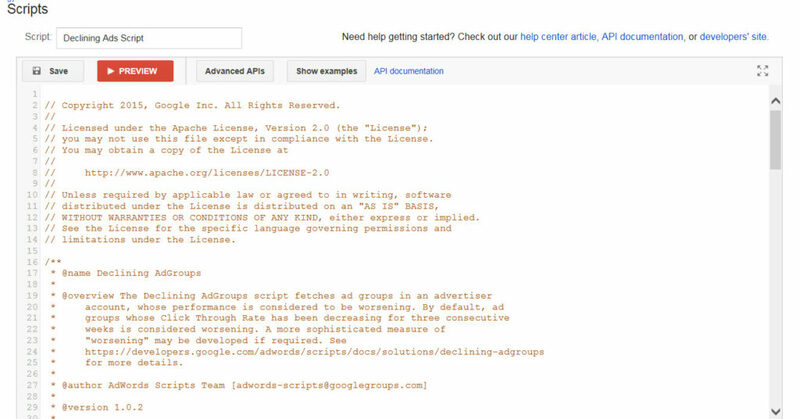 RLSA ads appear within Google search results themselves. To use remarketing and RLSA, you’ll need to tag your website. There are two ways to tag your site: with Google Analytics, or with the Adwords remarketing tag. 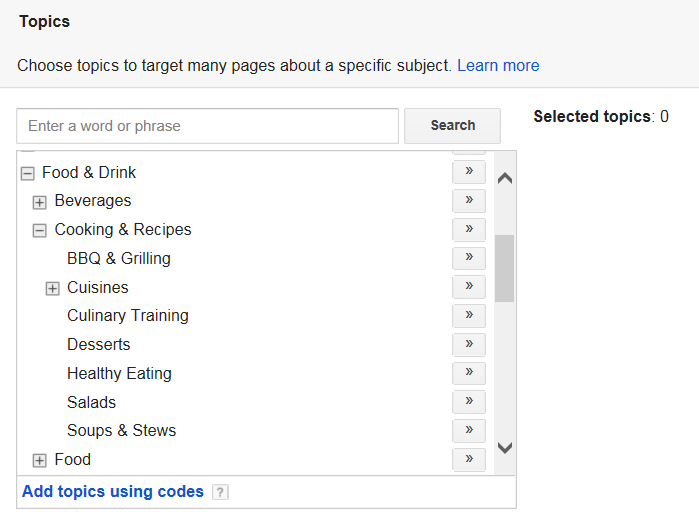 If you’re using Google Analytics, remarketing is included as part of the code. There is no further code setup needed. Click “Tag Details” to get the actual tag to place on your site. Remarketing and RLSA use the same tag. Be sure to place the tag on every page of your website to provide the most opportunities to reach previous site visitors. Once your site is tagged, you can start creating audiences. Audiences are groups of people with similar behaviors. For example, you might create an audience of converted visitors: people who completed a sale or reached the “thank you for signing up” page. Think about your customers and what behaviors they engage in. Do people who purchase usually browse several pages on your site before buying? Do they spend a long time on your site? Are there key pages you want them to visit? Create audiences for each of these behaviors. If you want to create a list of users who visited your Products page, for instance, you’d specify that in the “People who visited a page with any of the following” section. You might put “/products”, for example; or use the full URL if you only have one products page. Think carefully about your membership duration. This is how long a user stays in the remarketing audience, and the number of days should correspond with the length of your buying cycle. If users usually purchase within a week, you may want to set your membership duration to 7 days. If you have a longer buying cycle, you might want to go 90 days or even longer – the upper limit is 180 days. Don’t keep people in your remarketing audience longer than necessary – you don’t want to annoy users by pushing products to them that they no longer need. 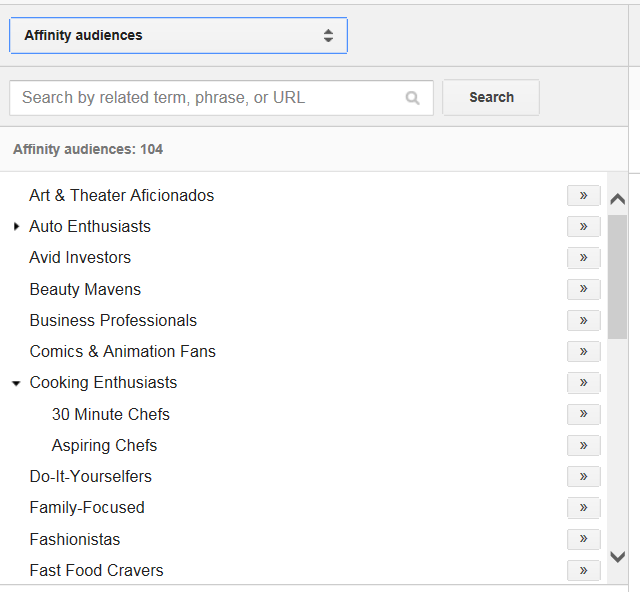 Once your audiences are set up, you can use them as targeting criteria in your Adwords campaigns. 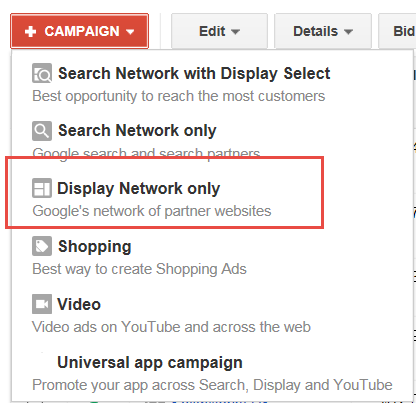 To use remarketing, which shows ads in the Google Display Network, create a Display Network Only campaign in Adwords. 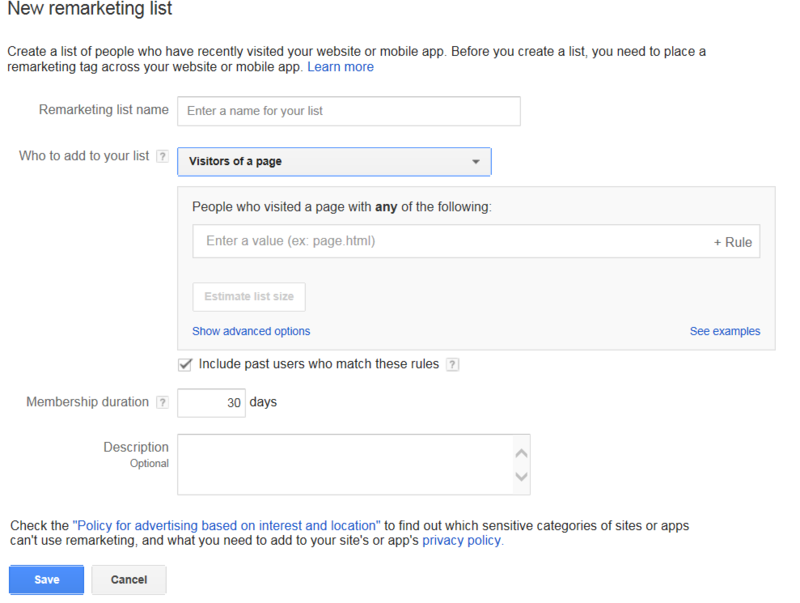 Then create the ad groups you want to use for remarketing. 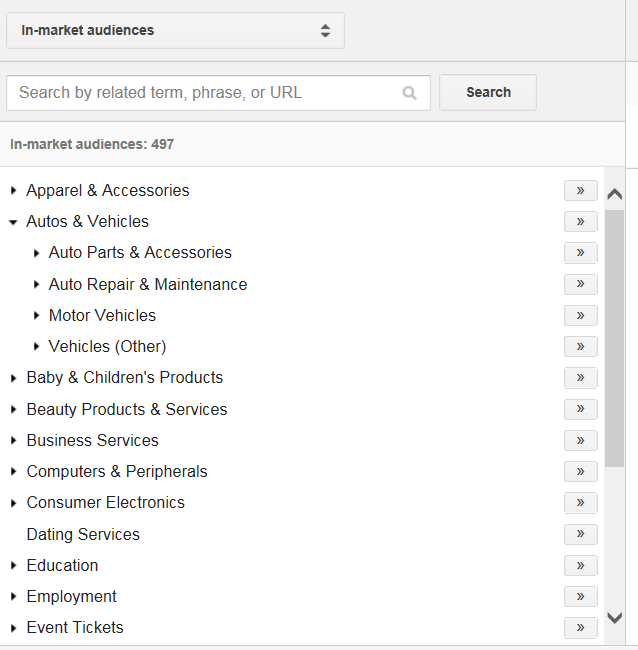 Navigate to your first ad group and go to the Display Network tab, and then choose “+Targeting / Interests & Remarketing.” From there, select the remarketing audience you want to target. It’s important to think about ad messaging before you start a remarketing campaign. You don’t want to just show the user the same offer they’ve already seen. Think about user behavior and what makes sense: should you show them a special deal? A piece of content to help them make a purchase decision? An ad for a complementary product? Putting some thought into your ad strategy up front will help make remarketing successful. RLSA is similar to remarketing, except the ads show in the Google search results, rather than the GDN. You’ll add an Interests & Remarketing audience for RLSA the same way you did for remarketing. As with remarketing, be sure to think about your ad copy and what makes sense. RLSA is your opportunity to show different search ad copy to previous visitors of your site – take advantage of it! RLSA has 2 different bid settings: Target & Bid, and Bid Only. Target and bid will restrict your ad delivery to those who are in your remarketing audience. No one else searching on the keywords in your RLSA campaigns will see your ads. Target and bid will be your most common setting for RLSA. 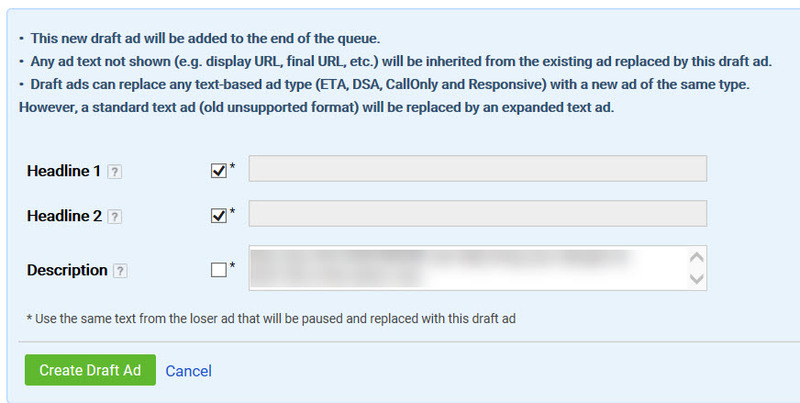 Bid Only is an interesting setting that enables you to set different bids for the users in your remarketing audience, while still showing ads to everyone searching on the keywords in the campaign. For example, you may want to use Bid Only for high purchase intent keywords, setting a higher bid for those who have already visited your website to help improve the position of your ad against competitors. Be aware, though, that Bid Only ads will serve to everyone who searches on the keywords, so use with caution. • Use broad match keywords. Since you’re only targeting users who’ve visited your website and taken a desired action, you don’t need to worry about driving untargeted traffic from broad match. Broad match in RLSA allows you to cast a wide net to reach your audience. • Use higher-funnel keywords. In regular PPC, you probably wouldn’t bid on single-word keywords like “ink” or “toner” because they’re just too broad and untargeted. With RLSA, you can afford to bid on these keywords, because the audience is smaller and is already pre-qualified by their previous visit to your website. When using remarketing and RLSA, keep in mind that you can use negative audiences as well as target audiences. Negative audiences are similar to negative keywords: they prevent your ads from showing to people in the audience. If you’re targeting people who visited your site but didn’t convert, it’s a good idea to add “converted visitors” as a negative audience to make sure your remarketing ads don’t show to them. You also may want to consider creating negative audiences for people who bounced from your site, or who visited customer service pages, because these visitors are likely not qualified. Remarketing and RLSA are highly effective ways to convert customers who’ve already visited your website. What’s your favorite way to use remarketing or RLSA? Share in the comments! A/B testing is the bedrock of a good PPC campaign. It’s so important that I’ve written about it on this blog 46 times. Just last week, I wrote a review of AdAlysis, an A/B testing and multivariate testing tool. 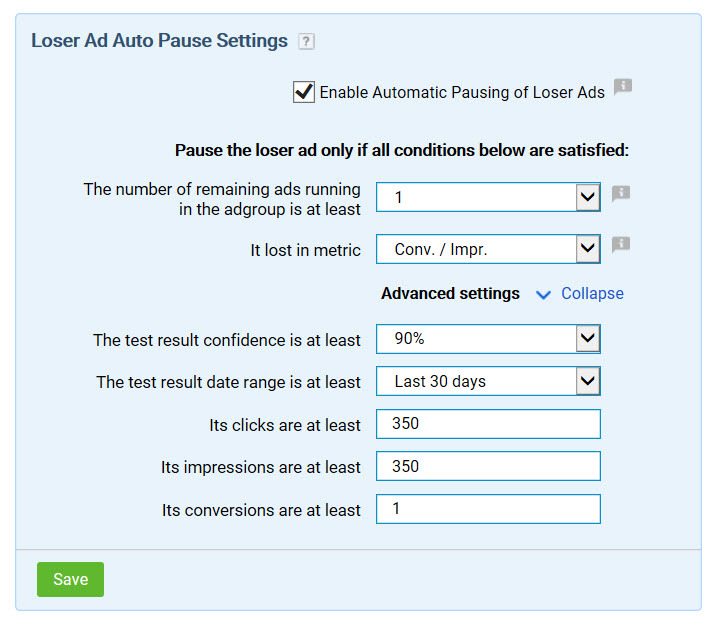 And just 2 years ago, I asked, can too many ads ruin PPC ad copy testing? Spoiler: The answer is yes. Testing too many ads at once creates a myriad of issues, including taking forever to reach statistical significance in all but the highest-volume PPC accounts. That’s right. Google is telling us to forget ad copy testing and just let Google pick the winners. 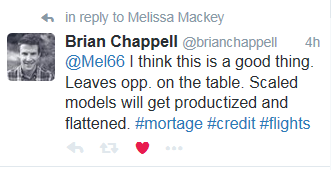 To a novice PPC advertiser, I’m sure this is music to the ears. 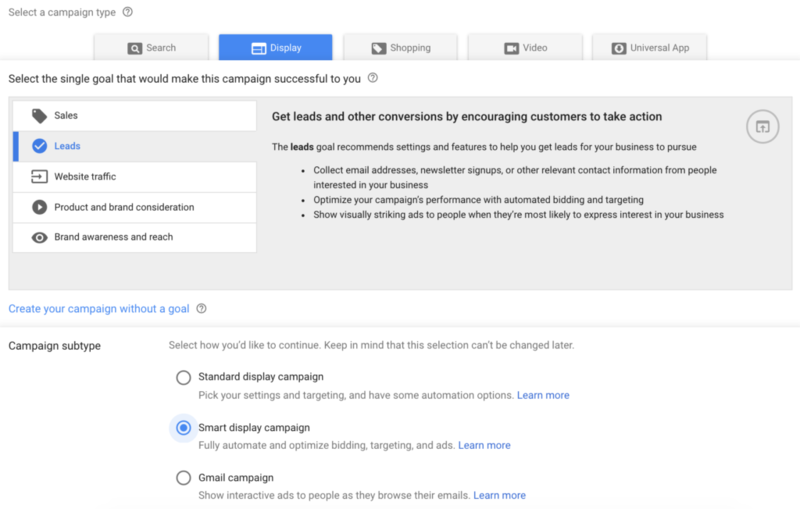 Small business owners and in-house marketers who are dipping their toes into Adwords management are probably thrilled to hear that they don’t have to worry about A/B testing ad copy. They can just throw a few random ads into their account, and let Google pick the winner. How many successful business owners do you know who let their vendors tell them what products to stock in their stores? When pharmaceutical companies started paying big bucks to get doctors to prescribe their medication over others, the public lost its collective mind. “How dare they buy off the doctors?” If you walked into a clothing retailer who claims to carry multiple brands, and only found Calvin Klein, wouldn’t you wonder about the store owner’s sanity? It’s called putting all your eggs in one basket. It’s not smart business. And it’s not smart advertising. I get it. 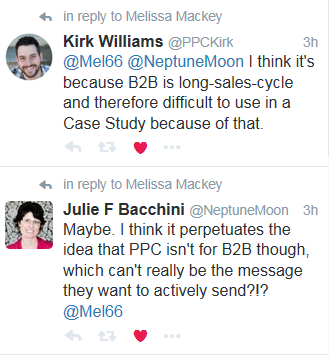 PPC is complicated. And hiring a professional PPC manager is expensive. That’s why many novice business owners and in-house marketers try to tackle PPC on their own. But it’s too complex. PPC is not something you can DIY. You wouldn’t try to fill a cavity yourself. Or replace the roof on your house. Or do your own business taxes. Or elect a president who stands to personally line his pockets using the office. (Wait, did I say that out loud?). 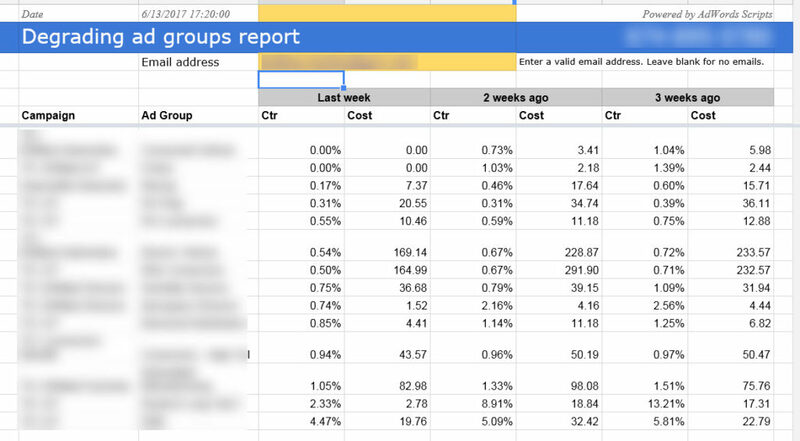 The point is, you shouldn’t try to do PPC alone. Years ago, you could. Today, it’s just too complicated. And Google is out there trying to get you to turn the whole thing over to them. Don’t fall for it. Hire a professional. Use A/B testing liberally. Make your own business decisions. Julie Friedman Bacchini wrote a great post breaking down the fallacy of the Google article on SEL – go give it a read. And let me know what you think about the Google article. Do you see any merit in it? Are we really heading toward a world where we just let Google make all the decisions? Share in the comments!